Bar in Camden Town, specialising in 'craft beer'. It's run by Scottish brewer BrewDog, who have several other venues in London including Shepherd's Bush, Shoreditch and Clapham Junction. This venue is quite small, with two floors (ground floor and basement) and two bars. In keeping with the brewer's style, there are no cask ales, but only keg taps. 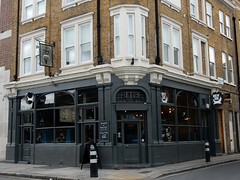 They offer a core range of BrewDog's own beer and a rotating list of guest beers (from BrewDog and other breweries, both in London and beyond), which is on their website. All beers can be requested in thirds, halves, two-thirds or pints, but the menu above the bar lists the default serving (smaller measures for the stronger brews). On her July 2015 visit, secretlondon had a pint of Weihenstephaner Hefeweissbier (about £5) and a pint of Fourpure's London Beer City 2015. Other people had Punk IPA. The occasionally have tap takeover events, with a range of brews from a guest brewery, and Ewan has visited for a number of these, at which times the bar tends to get very busy. secretlondon visited one Friday evening in August 2015. We sat in the basement but despite the presence of some taps, the bar there only sold bottles, so we went back to the ground floor for beer. Ewan has often found the basement to be a little less busy than upstairs, but at off-peak times (particularly weekends), there's usually a good amount of space. There are booths upstairs, as well as some smaller high tables opposite the bar. There is a short food menu, which includes pub food staples like burgers and fries (they also do American-style tater tots) with various toppings as extras. However, when the kitchen is closed, they only have cold food available. secretlondon visited late, so had a large pork pie. Accessibility: There is a single unisex toilet in the basement, and separate male and female toilets on the ground floor to the right of the bar. However, there are steps up from the entrance to the main bar area (where the toilets are located). Last visited by secretlondon, August 2015. Opening hours taken from the BrewDog website, August 2015. Last edited 2015-09-06 09:55:26 (version 5; diff). List all versions. Page last edited 2015-09-06 09:55:26 (version 5).